This is hard to explain. 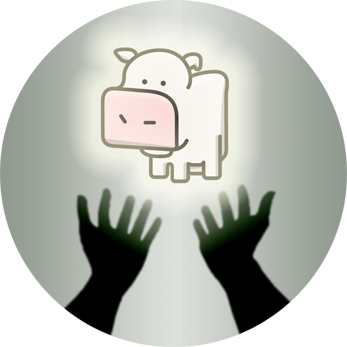 Something’s happening to Cow Clicker. Some months ago, evil bovine lords broke into Cow Clicker and started making demands. Their mysterious clues became the Cow ClickARG, which, Inception-like, sent up Alternate Reality Games from within the send-up of a Facebook game. Clues were scattered by the “bovine gods” around the globe, where “cowllective intelligence” helped solve the mystery. The cowpocalyse cometh, revealing its methane time-bomb. The bovine evildoers have initially set the moo-msday date to 21 July, which just happens to be Cow Clicker’s birthday, and one month from today. But a dark udder hangs overhead: for every cow that is clicked by anyone in the game, thirty seconds are removed from the cowntdown timer. If it elapses, the entire clicking center will shut down. As I told my clickers, we are in a battle with and against our very pointers. But perhaps you can stop them by paying supplication to the ruminant gods. If your oblation is deemed worthy by the fractious bovinity, then time will be added to the doomsday clock, staving off the cowpocalypse… for now. Bovine supplication involves… paying Facebook Credits as sacrifice! I’ve never played this cow-clicking game, satire or no satire, but I must say, this money-grabbing is low. Sorry it took me so long to reply, Oreily. I was busy snorting cocaine off the hood of my Bentley. This is possibly the most awesome doubling down I’ve seen in a long time. Rock on with your bad self. As much as it is meant as a satire, I think this experiment somehow starts to eat its own tail now. Why do I think so? Well, many facebook games sell “immediacy” for a while now. What was *the* prime invention of the interaction paradigm has become now the trap of all those players that are so accustomed to its “real-time” conventions. Right now,I believe that Cow Clicker just points out the possibilies of the reversal of this business practice: To sell delay/avoidance. I really applaud this “critical” project, it has been one of the coolest acts out there, but I’m not so sure if it is still able to maintain its point. I’m feeling an intense urge to join this game and click madly to blow it all up. On the one hand, I’m reminded of one of my favorite Bob Christgau quotes: “Irony: An excuse for anything, and a reason for nothing.” On the other I’m reminded of one of my favorite pranksters, Oral Roberts. So in short I’m torn. It’s point has changed, and I think that’s part of the pointâ?¦ although there’s a point at which that’s no longer possible. We’ll have to see what that is. That’s certainly one of the interesting features of the cowpocalypse, to me. One can bring about the rapture. It’s a fragile system. Weirdly, this is one of the most earnest features the game has ever had.